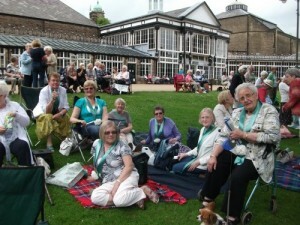 By Margaret: Barbara Davenport was the speaker at the last meeting of Glossopdale Womens’ Institute. She talked to Members about her passion for singing, that has lasted throughout her life. Concentrating mostly on her childhood she told members how, at 5 years old, she was determined to be the girl chosen to sing Papa Picolino at a school performance. A little older she was heartbroken when another girl was chosen to perform, but delighted when her rival developed chickenpox at the last moment and she got her chance to perform in public. She revelled in the applause which resulted – and had to be forcefully removed from the stage by a teacher in the wings! Lively, amusing and illustrated by excerpts from many of her songs, she kept Members entertained throughout her talk. To the disappointment of her coach, she decided against making a career in music, but it has remained a large part of her life. Presently she is establishing a choir from Women’ Institiute ladies from all the local Institutes who just enjoy singing and several Glossopdale Members who have attended could confirm how enjoyable it is. At their next meeting on Wednesday 16th July at 9.30 am at the Labour Club, members will be going much further afield when Pat Alker talks to them about the Silk Road in Uzbekistan. All ladies are welcome to come and share in the experience with us.